I had a lot of self-harm over the years playing that song. I was very glad not to play it for many years. I broke my shoulder. I got into some very dark places on the stage. I'd rather not step back into that song, but I found a way by thinking of where it came from and going back to the books I was reading at the time. I realized the real influence was probably Flannery O'Connor, so I developed this character called the Shadow Man and I'm managing to step into the shoes of the Shadow Man without any self-harm. 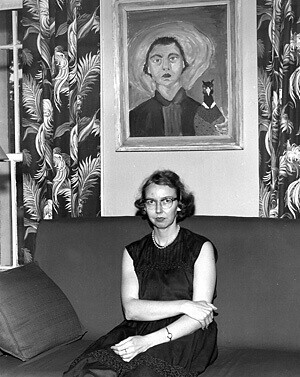 Because of you, Shadow Man, I went back to Flannery O’Connor (1925–1964) this summer, too. (That's her pictured below.) Bono said he found you in Wise Blood, and when I re-read Wise Blood I found you there, too. You’re right by Hazel Motes, the novel’s central character, who’s trying his hardest to stop believing in the “hands of love”: “Haze’s shadow was now behind him and now before him and now and then broken up by other people’s shadows, but when it was by itself, stretching behind him, it was a thin nervous shadow walking backwards.” You were sometimes following him; sometimes leading him; sometimes you went to pieces; alone, you were retreating from him. I also re-read “A Good Man is Hard to Find,” “Everything that Rises Must Converge,” “Revelation,” “Good Country People,” “The Enduring Chill,” and more. But this time I read it all with you haunting me, creeping around the trees, giving me eyes to see the two Americas U2 saw then in the 1980s … and now. And I saw the two realities troubling the modern person O’Connor saw in the 1950s. And yea, I even gained a clearer vision of how well William Blake expressed the Two Contrary States of the Human Soul in his Songs Of Innocence and of Experience in the late 1700s. Where is there a place for you to be? No place. Nothing outside you can give you any place. … You needn’t to look at the sky because it’s not going to open up and show no place behind it. You needn’t to search for any hole in the ground to look through into somewhere else. You can’t go neither forwards nor backwards into your daddy’s time nor your children’s if you have them. In yourself right now is all the place you’ve got. If there was any Fall, look there, if there was any Redemption, look there, and if you expect any Judgment, look there, because they all three will have to be in your time and your body and where in your time and your body can they be? Where in your time and your body has Jesus redeemed you? … Show me where because I don’t see the place. If there was a place where Jesus had redeemed you that would be the place for you to be, but which of you can find it? … Who is that that says it’s your conscience? … Your conscience is a trick … it don’t exist though you may think it does, and if you think it does, you had best get it out in the open and hunt it down and kill it, because it’s no more than your face in the mirror is or your shadow behind you. Is it true? Is it a lie? Tell me, tell me, tell me the answer, oh Shadow Preacher Man. I wanted a better appreciation of how O’Connor’s art influenced U2’s art, and I have Bono’s Shadow Man to thank for my wanting that. And what did you do this summer, Shadow Man? Did you build? Did you pull down? You found more Hazel Moteses this summer, didn’t you? In Manchester, London, Paris, Levallois-Perret and Barcelona. And in America, outside in America, you went back to Charlottesville. Bob Dylan encouraged Bono to know where he came from if he wanted to know where he was going. Dylan was talking about being a musician and specifically about Irish folk music to Bono, but the conversation helped Bono realize his need to learn much more about the American roots of rock 'n' roll. That advice came in 1984, when Bono first met Dylan to interview him and Van Morrison for Hot Press. The really important reading that I did began in my late twenties, with authors like Flannery O’Connor. There was something in those stories of hers that I felt captured a certain part of the American character that I was interested in writing about. They were a big, big revelation. She got to the heart of some part of meanness that she never spelled out, because if she spelled it out you wouldn’t be getting it. It was always at the core of every one of her stories — the way that she’d left that hole there, that hole that’s inside of everybody. This excellent analysis of what Springsteen took from O’Connor gets at his artistic desire to present America as unsympathetic toward troubled searchers, people who feel out of place, just about out of hope, and physically and existentially exhausted. Since U2 were hungry to learn about America in all ways, it would have been natural for Bono to ask The Boss for reading recommendations and it would have been natural for The Boss to direct Bono’s attention to a writer who saw the meanness in the American experience and then captured it on the page. In 1986, as The Edge tells it in U2 By U2, it seems that Bono was able to bring some ideas to the band based on his relatively recent readings in O’Connor: “after The Conspiracy of Hope tour” — a tour of six concerts in the United States for Amnesty International in June — "we were still short of a few songs. We spent a lot of time talking about what [The Joshua Tree] was going to be. Bono had been reading Flannery O’Connor and Truman Capote. … The language of the American writers particularly struck Bono, the kind of imagery and cinematic quality of the American landscape became a stepping-off point." The Two Americas was Bono’s working album title for The Joshua Tree. We know he was reading William Blake at that point, too: U2 recorded the song “Beautiful Ghost/Introduction To Songs Of Experience” during The Joshua Tree sessions. These lyrics are a recitation of Blake’s “Introduction,” the poem that opens his Songs Of Experience collection. It’s interesting to think how The Joshua Tree could very well have been called The Two Contrary States Of America’s Soul if Bono had borrowed even more from Blake in 1986/7 — and the songs as we know them on the album could stay just as they are under that title. Fortunately, Anton Corbijn found a Joshua tree. Not wanting to let a good idea get away, though, U2’s going to bring us the song “American Soul,” now 30 years later, on this year’s upcoming album Songs of Experience. In July 1985, I went to meet up with T Bone [Burnett] at a hotel in London’s West End — I think it was called the St. James — and T Bone told me that Bono was coming round to see him. He told Bono about my poetry and gave him a copy of one of my books. We then all went out to lunch at a Soho restaurant. (I had to keep leaving to call my wife to see if our baby was on the way! This was before cell phones.) I don't recall exactly how Flannery O'Connor came up. I think we were discussing Christianity and the arts and I mentioned Mystery and Manners, which he was really interested in. I'm fairly certain that Bono had not yet read O'Connor because he was anxious to buy some of her work. After lunch we went to Foyles on Charing Cross Road, which was nearby, and he bought two or three of her books. He was in town because of Live Aid and wasn't as well known then — all he needed to do to disguise himself was to put on a small peaked cap! He was really keen for me to keep in touch and advise him on recommended reading matter. I sent him the book Red Hill: A Mining Community by Tony Parker after he asked me to find stuff on the British miners' strike for a song he was working on. For some years later I did this service on a more formal basis for about a decade. As the day begs the night for mercy. I hear an emotional echo in these first lines to the “I can’t believe the news today / I can’t close my eyes and make it go away” of “Sunday Bloody Sunday.” Both songs are about wrestling with the reality of life cut short by inexplicable violence and our wanting a merciful release from today’s news. Both songs are about death and how it forces us to look both inward and forward. The sky was a chill gray and a startling white-gold sun, like some strange potentate from the east, was rising beyond the black woods that surrounded Timberboro. It cast a strange light over the single block of one-story brick and wooden shacks. Asbury felt that he was about to witness a majestic transformation, that the flat of the roofs might at any moment turn into the mounting turrets of some exotic temple of a god he didn’t know. The illusion lasted only a moment before his attention was drawn back to his mother. She had given a little cry; she looked aghast. He was pleased that she should see death in his face at once. His mother, at the age of sixty, was going to be introduced to reality and he supposed that if the experience didn’t kill her, it would assist her in the process of growing up. He turned his head. … He shuddered and turned his head quickly the other way and stared out the window. A blinding red-gold sun moved serenely from under a purple cloud. … His limbs that had been racked for so many weeks by fever and chill were numb now. The old life was exhausted. He awaited the coming of new. It was then that he felt the beginning of a chill, a chill so peculiar, so light, that it was a warm ripple across a deeper sea of cold. … He saw that for the rest of his days, frail, racked, but enduring, he would live in the face of a purifying terror. A feeble cry, a last impossible protest escaped him. But the Holy Ghost, emblazoned in ice instead of fire, continued, implacable, to descend. This point about Asbury going through “a purifying terror” reflects O’Connor’s understanding that God will bring someone through the most tragic experiences and use the pain to birth peace. While O’Connor is often described as a Southern Gothic writer and master of the form of the modern grotesque, it’s imperative to read closely the endings of her stories so as not to miss how the dark humor and violence in her plots leads to the transformation of one or more of her characters into more peaceful people finding spiritual healing. That’s not to say her endings are “happy,” or all of the characters are redeemed, or even that any in-process redemption in the last paragraph of the story is completed on the page. I suppose the reasons for the use of so much violence in modern fiction will differ with each writer who uses it, but in my own stories I have found that violence is strangely capable of returning my characters to reality and preparing them to accept their moment of grace. Their heads are so hard that almost nothing else will do the work. This idea, that reality is something to which we must be returned at considerable cost, is one which is seldom understood by the casual reader, but it is one which is implicit in the Christian view of the world. … With the serious writer, violence is never an end in itself. It is the extreme situation that best reveals what we are essentially, and I believe these are times when writers are more interested in what we are essentially than in the tenor of our daily lives. Violence is a force which can be used for good or evil, and among other things taken by it is the kingdom of heaven. … The man in the violent situation reveals those qualities least dispensable in his personality, those qualities which are all he will have to take into eternity with him … and since the characters in this story are all on the verge of eternity, it is appropriate to think of what they take with them. … In any case, I hope that if you consider these points in connection with the story, you will come to see it as something more than an account of a family murdered on the way to Florida. 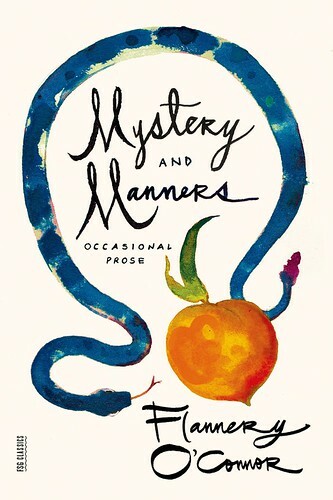 I’m thinking of Bono, in 1985, starting to read O’Connor’s fiction more closely and also reading her talk about the “serious writer’s” interest in violence in Mystery and Manners. I’m also thinking of Bono reading other American writers at that time, such as Truman Capote and Norman Mailer, who captured violence in their nonfiction accounts of troubled American killers. Tassoula Kokkoris wrote about Bono being “Under The Influence of The Executioner’s Song” as U2 composed “Exit,” and in O’Connor’s Hazel Motes we find a similar meanness and violence in fictional form, expressed with rich symbolism and imagery throughout Wise Blood. Because it is fiction, however, in O’Connor’s novel she was able to tell a story more in keeping with her desire to present violence as a force for redemption. That is when I started to realize that the lyrics on the first four albums were not really lyrics at all, they’re sketches. I wasn’t a writer, really, I was a painter, or an emoter or a shouter. … With Joshua Tree, I decided I’d better write some lyrics. I was reading more anyway, so I was more awake to the word. I discovered a love for writers and started to feel like one of them. Hazel Motes becomes fixated on silencing what he finds too troubling to hear. He becomes a taciturn man, trying to drown out the voices that talk of God. There are no lyrics in “Exit” or any of the album’s other songs that are direct references to Wise Blood. 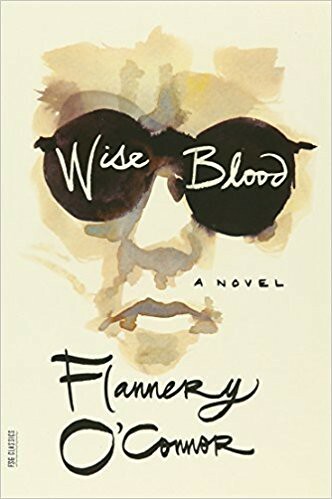 We only have Bono telling us he was reading O’Connor when writing the album’s songs, and that now, in 2017, he developed the Shadow Man for performing “Exit” because for that song, “the real influence was probably Flannery O'Connor.” Rather than hazard a summary of Wise Blood’s plot here, I think a better way to appreciate its influence on The Joshua Tree is to read the novel, then listen to the album to see if you don’t hear from U2 the feelings O’Connor gave to Hazel Motes. I think you’ll hear the aesthetic influence from novel to album, from writer to writer. In both works of art, there’s a creeping approach of the darkness and meanness one can get wrapped in after having searched and searched only to feel even further away from hope, peace and love than ever before. 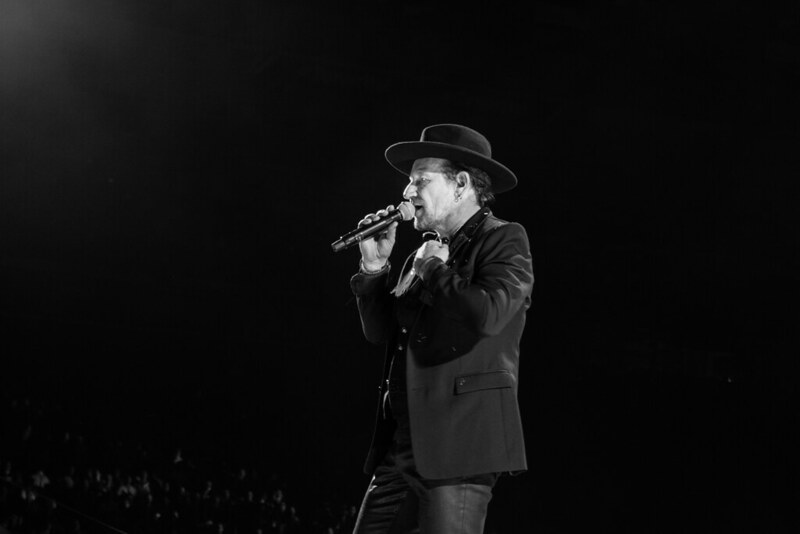 The Joshua Tree opens with strong evocations of hope in the search, but by the fourth song, “Bullet The Blue Sky,” we hear in Bono’s righteous anger that the soul is gaining some experience and has the capacity for anger. And it is the experience of anger that makes the Shadow Man cometh. Seeing an open door, he comes from the desert to lurk in and out of focus as the album’s tracks continue. Sensing there is also despair, grief and longing in the soul, the Shadow Man draws enough strength from all these feelings that by “Exit,” he has grown large enough to eclipse the innocence of the soul. What’s left during this temporary blackout is the contrary state of the soul, the one that wants violence. O’Connor has suggested that violence is a tool that can be used by the kingdom of heaven, and one’s oncoming death reveals what you’ll take into eternity. After the violence in the next-to-last chapter of Wise Blood, what’s left for Hazel Motes? I hope you’ll read the novel to find out. And then, after finishing the book, I hope you’ll watch John Huston’s 1979 film adaptation, Wise Blood, and enjoy the similarities and differences. Bono is fond of quoting another American writer, Sam Shepherd, to explain why he often finds himself between two opposing states: “Right smack in the middle of a contradiction, that’s the place to be.” Bono adds, “There are more contradictions in rock-and-roll than in any other art form and I think that’s good.” Back in 1790, William Blake wrote in the opening of “The Marriage of Heaven and Hell”: “Without Contraries is no progression. Attraction and Repulsion, Reason and Energy, Love and Hate, are necessary to Human existence. From these contraries spring what the religious call Good & Evil.” I imagine Bono’s read that bit by Blake, too. The American Southern Gothic writer O’Connor and the English Romantic Blake might not seem to be complementary artists at first, but upon digging into both, it’s not long before their common interest in the split soul appears — and it’s no wonder these two authors have a special resonance for Bono. If in a fit of megalomaniacal art criticism, I might say Bono has been trying to articulate the contrary states of the soul since U2’s Day One, and in the mid-’80s O’Connor gave Bono an artistic conviction and an example to follow. I would think Bono felt empowered with more poetic license to present violence, with honesty and integrity, as a tool for redemption. The core of Experience is — and this is cheeky! — ‘I can change the world, but I can’t change the world in me.’ And so you realize that the biggest obstacle in the way is yourself. There are things to rail against, and there are things that deserve your rage, and you must plot and conspire to overthrow them. But the most wily and fearsome of your enemies is going to turn out to be yourself. And that’s experience. There might not be any lyrics directly referencing O’Connor on U2’s next album, but it’s no secret at all that Bono will sing again of the violence that dims our lives, that occasionally eclipses the sun, and that sometimes puts our world in darkness tonight. We’ll have new songs cast in the valley of the Shadow Man and U2 will help us sing our way to where we fear no evil.